Old stock Ocean Jasper oval. Light multi-layered orbs with rust-colored centers in a hazy green matrix. OJ colors you don't see every day. Cut from the same slab as this cab. 40mm x 30mm x 7mm. Weight: 60.80 carats. Do you like Ocean Jasper Cabochons? 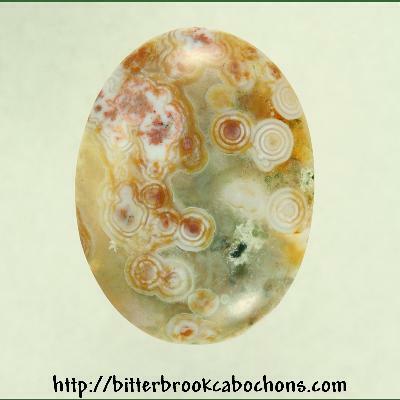 Click here to see all of the Ocean Jasper Cabochons on the site! You are visitor number 95 to this page this year.